Much is being published regarding the plans and petitions coming before the 2019 General Conference. There is also much prognostication going on regarding those plans. To keep readers of MIconnect informed, we include both plans and prognostications in our weekly news. (This week see Praying for Nothing and Anything by retired Bishop Michael Coyner, and Weighing in on A Way Forward by Sam Hodges of United Methodist News Service. Much more, of course, is available at umc.org and a host of other sites. Perhaps this is a good time to turn from plans, petitions, and prognostications to the people involved in the Way Forward. Those include Bishop David Bard, pastors, and laity around the state, and Michigan Conference delegates to General Conference. First, a reminder that Bishop Bard will be logging many miles this fall in his effort to listen and interact with persons around the 2019 General Conference. His most recent blog, A Joyful Journey, encouraged all to rise above fear to move ahead with joy. Citing Paul’s letter to the Corinthians, chapter 4, he notes: “Amid all the discouraging events in our world, amid uncertainty in the church, we hear Paul’s words, ‘We do not lose heart.’ We can, and should, look honestly at our lives and the world and see the struggles and pains and disappointments, yet we do not lose heart. What might that mean? In pondering that question, I identify three dimensions to not losing heart.” Read more here. The Bishop then shared dates and destinations for the second round of Connectional Conversations that will take place over the next three months starting September 25 and concluding December 6. Click here for the schedule of listening sessions and much more. These 11 sessions offer opportunities for every United Methodist in Michigan to express himself or herself and engage with issues, values, and possibilities that lie ahead. Another important way for all to become involved is with prayer. Become part of the worldwide prayer community at umcprays.org. 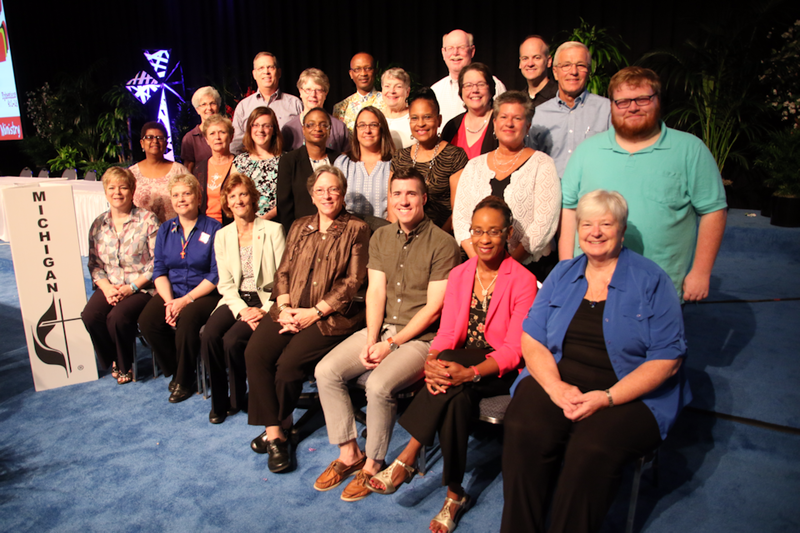 Finally, there are the people who make up the Michigan delegation, who are preparing their minds and spirits for the legislative work that will shape the future of the denomination. In 2014 the West Michigan Annual Conference elected their delegates to the 2016 General Conference in Portland. A year later, in 2015, the Detroit Annual Conference delegation was elected. Little did anyone know at the time that those persons would be attending two sessions of The General Conference. 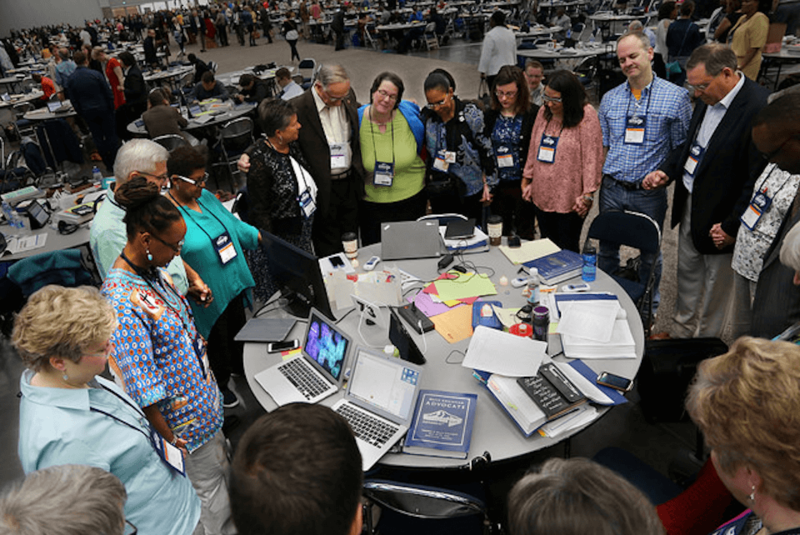 Annual Conferences were given the option of sending their delegates to the 2016 General Conference to the called session in 2019 or electing another set of delegates. When the 2017 Michigan Conference met in Acme, members to both the West Michigan and Detroit Annual conferences voted to send their 2016 delegates to St. Louis. The Rev. Dr. Charles Boayue and Nichea Guy serve as co-chairs of the combined delegation. Nichea Guy explains that these delegates are currently designated “as elected by West Michigan Conference” and “as elected by Detroit Conference” but will be seated as a Michigan Delegation once in St. Louis. As they did in preparation for the 2016 General Conference, the delegations are preparing for the 2019 Session together. Historically neither the Detroit nor West Michigan delegations have voted “in a block.” “We each vote our conscience,” Guy said. Bishop Bard has announced that members of the Michigan delegation will be joining him in the settings for Connectional Conversation.